This unique dining chair offers a casual café bistro look with natural colored synthetic bamboo style frame. 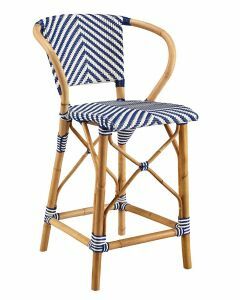 Its Navy Blue & White woven synthetic weave is styled in a classic Herringbone pattern, to both seat and back. 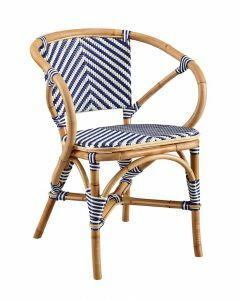 Perfect for a small deck or patio or install in groups for a perfect French Bistro style feel any day or night! Measures 17.3”W x 32.7”H x 20”L. Click on images for greater detail.